At first glance, this small Israeli home looks somewhat unassuming. But the dark grey modern cube hides an open floor plan full of light and eco-friendly features you wouldn’t expect to find in a home of this size or this locale. Israelevitz Architects tackled a big design on a small footprint, with a three-level home that is as cozy and comfortable as it is earth-friendly. With energy-saving heating and cooling and a rooftop photovoltaic system, this chic little house is more than just a home for a busy Tel Aviv family. 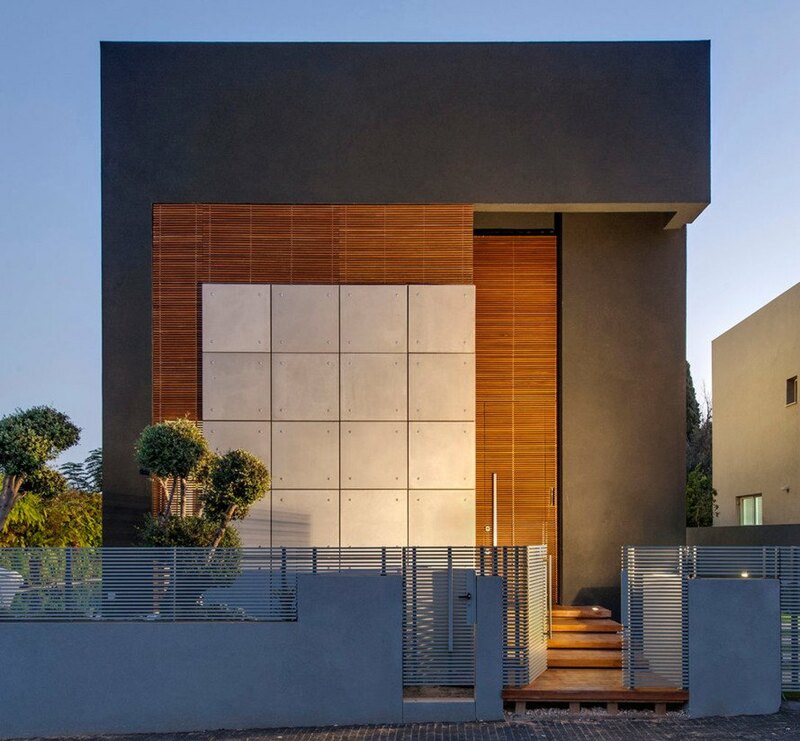 Dan and Hila Israelevitz of Israelevitz Architects were called upon to tackle a challenging project for an active family of five. The mission: create a unique, eco-friendly home that could sit on a relatively small, square lot. It’s not a stretch to say that the architects achieved that goal in spades. The pair used creative shapes and materials to make the small space appear larger than its footprint, connecting interior and exterior spaces with glass and light. 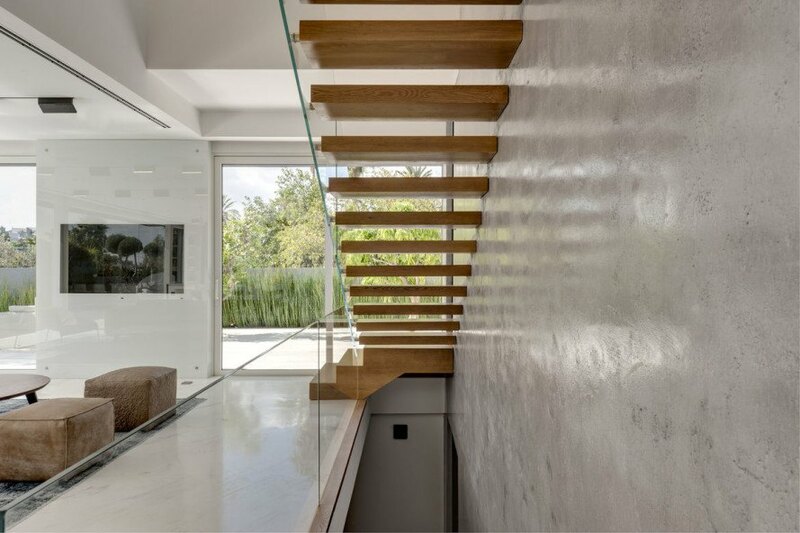 The first floor of the living space is consumed by an open kitchen and sitting area bordered by a floor-to-ceiling glass wall, which overlooks a pool that runs nearly the length of the home. A repeated energy air-conditioning system heats the pool, conserving energy without skimping on luxury. Upstairs, the master bedroom offers near panoramic views of downtown Tel Aviv, making the space feel open and airy. The windows are equipped privacy shades that create seclusion while still filtering in quite a bit of natural light. The master bath, with its round, free-standing tub, is where we’d want to spend all our time. The floor is covered in black mosaic tiles, a stark contrast to the tub’s crisp white pallor. An otherwise cold space is accented by a warm oak vanity and accents, which lend a zen sensibility. 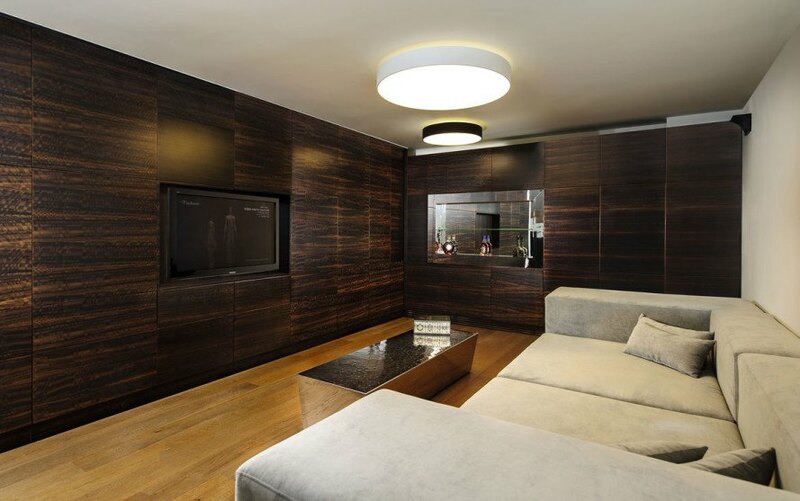 The basement holds a recreation room and bedrooms for the family’s two older children. The sound-proofed entertainment room is equipped with dark wooden wall paneling, inspired by an English pub, and features a wine bar and flat screen TV. This small home is impressive from the backyard as well, where the entire structure appears as a graphite block with minimal openings, giving the impression that what resides within is a secret – or, at the very least, shy. But the bold angles and dark shade playfully interact with the orchard-inspired landscaping, creating a fun outdoor space for entertaining. What isn’t seen, but is certainly felt in the homeowners’ utility bills, is the rooftop solar panels which supply around 80 percent of the electricity used in the home. Dan and Hila Israelevitz of Israelevitz Architects were called upon to tackle a challenging project for an active family of five. The mission: create a unique, eco-friendly home that could sit on a relatively small, square lot. It’s not a stretch to say that the architects achieved that goal in spades. The pair used creative shapes and materials to make the small space appear larger than its footprint, connecting interior and exterior spaces with glass and light. The first floor of the living space is consumed by an open kitchen and sitting area bordered by a floor-to-ceiling glass wall, which overlooks a pool that runs nearly the length of the home. 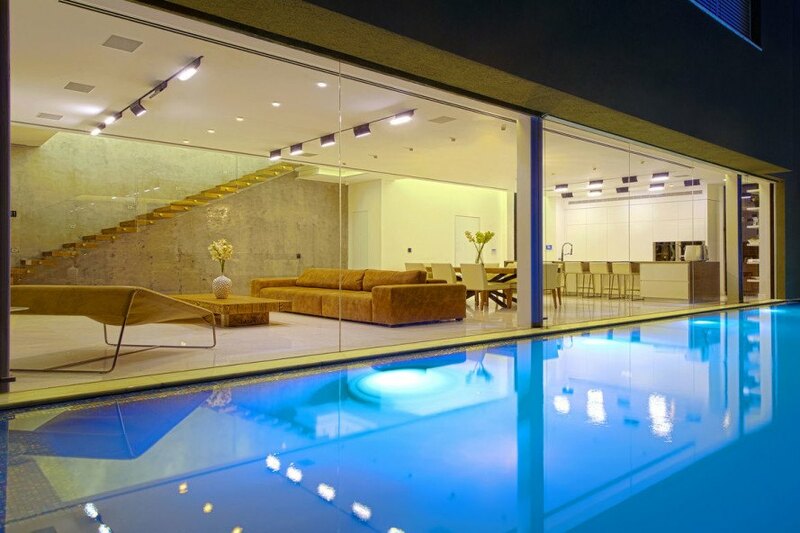 A repeated energy air-conditioning system heats the pool, conserving energy without skimping on luxury. Upstairs, the master bedroom offers near panoramic views of downtown Tel Aviv, making the space feel open and airy. The windows are equipped privacy shades that create seclusion while still filtering in quite a bit of natural light. The master bath, with its round, free-standing tub, is where we’d want to spend all our time. The floor is covered in black mosaic tiles, a stark contrast to the tub’s crisp white pallor. An otherwise cold space is accented by a warm oak vanity and accents, which lend a zen sensibility. This small home is impressive from the backyard as well, where the entire structure appears as a graphite block with minimal openings, giving the impression that what resides within is a secret - or, at the very least, shy. But the bold angles and dark shade playfully interact with the orchard-inspired landscaping, creating a fun outdoor space for entertaining. What isn’t seen, but is certainly felt in the homeowners’ utility bills, is the rooftop solar panels which supply around 80 percent of the electricity used in the home.